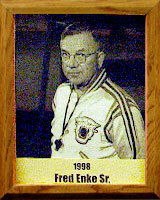 Best known as the basketball coach who led the University of Arizona Wildcats to a 37-year record of 510 wins and 326 losses, Fred Enke, Sr. was the fifth most successful coach in the United States when he retired in 1961. He was responsible for establishing golf as a varsity sport at the University of Arizona. He served as head football coach in 1931, and coached golf until 1966, before officially retiring as a professor of physical education in 1967. Enke was the first coach of any sport to be inducted into the Helms Foundation Hall of Fame in 1951; the first basketball coached named to the University of Arizona Hall of Fame in 1969; and was a charter member of the University of Arizona Sports Hall of Fame. Fred Enke, Sr. died at the age of 88.